Home > Article > Welcome to pre-Convention discussion! 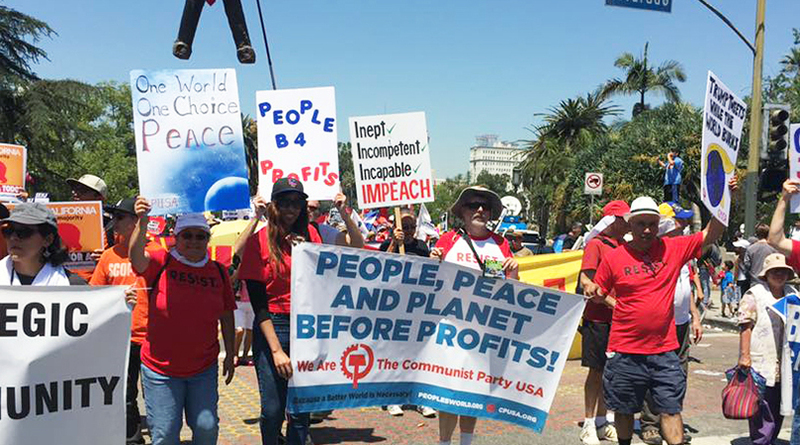 Welcome, comrades and friends, to the 2019 Pre-Convention Discussion Period of the Communist Party USA! Our National Convention will be held June 21-23, and Pre-Convention Discussion starts now! Charting a course to socialism is a collective work, and your ideas and experiences are needed. You don’t have to be a party member to participate. What we’re discussing is too important to be kept just to our members. We want the broadest possible participation in this discussion. Part of our discussion will be the new CPUSA Draft Program, but we encourage members and friends to examine every aspect of the party’s work. In particular, we encourage assessments of CPUSA’s strategy and tactics based on your experience in the various areas, struggles, and movements where you work and live. We also invite you to submit resolutions for consideration by the Convention and to propose amendments to the Draft Program. On our Categories page, you’ll find a few topics and questions to get discussion going. That list isn’t exhaustive, and you’re welcome to address other topics as well. For guidelines, as well as instructions on how to submit discussion pieces, resolutions, and amendments, check out How to Participate and Resolution Guidelines. In addition, you, and all of your friends and contacts, are invited to participate in a series of online discussions of the new draft Party program. All sessions will be at 6 PM eastern (5 PM central and 3 PM pacific) for about 90 minutes. We look forward to your participation. ¡La lucha continua!